The trees are beautiful! I just bought some of hero arts layering stamps. Love them! I really enjoyed watching your video. So many different ideas on how to do a night sky with stars. I like how you made the lights glow. What a really whimsical image! Reminds me of one you created with stamps before – and you did such a great job making it so fun, colorful and magical! I always think ‘EEK! that’s so dark!’ when you begin your shading, but it always smooths out beautifully. Thanks for all the great tips & tricks. Love your channel!! I love this! Amazing work. My best friend had a bug just like that as his his first car and has new one now. AND he always loves my homemade cards. I have to get that stamp set! Love how you colored the car and did the sky. I learn so much from your videos! This one is especially good and I need to rewatch so I can take notes. Thanks for all the inspiration. What a fun card. Luv the crazy, starry background. 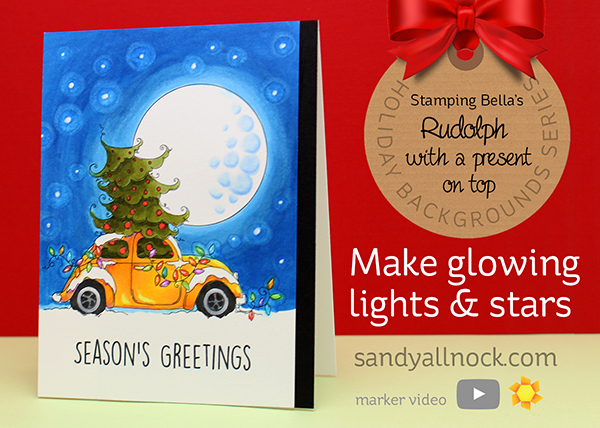 It’s loose and easy, like the stamped image…perfect companion to the car, tree and lights. Appreciate the details. I had my doubts about all those dots but it worked out wonderfully. I learned a lot with this one. You are awesome. You make everything just seem so real. I like the halos around the light and the little VW bug is so cute. It’s a tweeter punch buggy!! LOVE IT! Love this gorgeous card and your video. I learn so much, like I love the halo to make the image pop. Love this stamp and how you colored it! Our first car was a bug, but unfortunately not yellow! Love this – my first car was a yellow VW Bug and I loved it so much I now have a Silver Bug but I love yellow and my bug. Fabulous card. fantastic! Love how you did this. the stamp lots so cute. I really like watching and listening to how you do your cards. I like the background on this card and love the stamp. Of course I’d love to win it!! Memories flood back of the old game ‘slug bug’ a few years back while visiting my family who live in Texas. You have made that little ‘bug’ come to life Sandy – and for me the stand out is the amazing moon! Thanks for your video clips which really make colouring come to life. Blessings! I LOVE THIS STAMP! YOU MAKE IT LOOK SO EASY! I love this card!!! What a great stamp! Thanks for another great idea! Now I know how to “light up” my cards. I’m not a VW fan (I drive a Mustang also) but think you made it look adorable. Also thanks for the background series gallery — really helpful BUT now I have to make the time to actually go try out your suggestions. I look forward to Wednesdays now!! What a wonderful card. I always enjoy watching you color. It’s a real pleasure to listen to you color! Love your creativity, Sandy. This card is terrific. It’s wonderful to see how an artist sees color and thinks while working. Thanks for teaching us about color. Love your copic skills. Still trying to figure out if I want to go with copics for coloring. You make everything look so easy but I have to remind myself that you are an ARTIST, and I am not! Sandy, I love watching your videos and so do my two toddler boys. They love watching all the fun things you choose to color come to life. Thank you for sharing your gifts with us. The way the car goes home with that tree is obvious… It’s name is Herbie! Gorgeous card Sandy! I love all the bright colours,and it’s such fun watching you create! Wow!!! Such a cute card!!! I love how you did this very complicated image. Just fantastic! And your teaching method of letting us in on your thought process as you go is very enlightening. It truly inspires me that I could do these things too, with practice. Thank you. I loved this stamp the day I seen it. It reminds me of high school and all the VW Bugs we use to drive to school. The background is great and love to listen to your stories/thoughts when you color. TY for sharing and looking forward to next Wednesday. 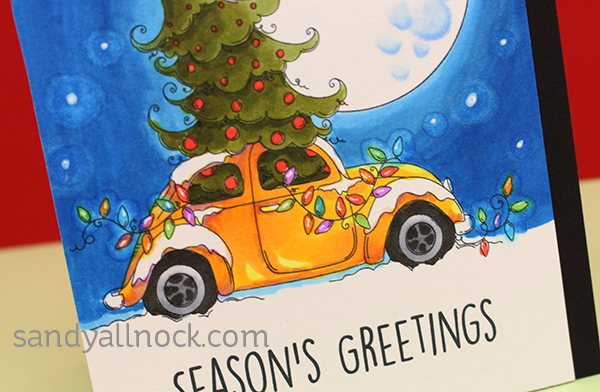 Love the background on this one and I love the tree in the VW Bug!! Great card! I feel like I could do this background without a problem. Thanks for doing these backgrounds for us!! You show me more and more things to help me in crafting process!! Loved this card, so pretty!! TFS!!! I love the bug! Like you I always wanted a VW bug of my own, never have had one though. It would be fun to have a stamp of a bug like this one and,with masking, use it for cards at different times of the year. How about the easter bunny driving it for egg deliveries! Always love your videos, thanks! That is the cutest card!! Love the colors you used and the background! I enjoy Christmas cards more than any other. Thanks for sharing! Your instructions are always easy to follow and easy to copy. Love the moon and stars as a background to this stamp set and your take on it is perfect! It really helps to see how your background develops. I love how you explain WHY you do things and your thought process as you work. And of course, the car is yellow! Love this cute card! Great coloring! Adorable card! Stampingbella images are wonderful and fun to color. Watching you color encourages me to be bolder with my color choices. Add this car to my dream fleet! Since I am unlikely to ever own this model, I should get the stamp. Very cute!